Mother's Day, Father's Day, pet photos and more. 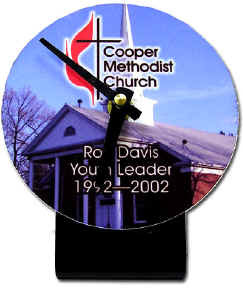 Clocks with your company logo and custom phrases like, "Member: Million Dollar Sales Club"
the quality picture, the better the clock. Performance Recognition, Sports Team, Schools, etc. Add a Photo of a Wedding, Children, Pets, Vacation, etc. Personal Messages are included in the price. your favorite photographs and put them to use! At Baysweb, we can create products as needed, and in any quantity, for any group or occasion. There are No Set-Up Fees or Minimum Requirements. We pride ourselves on our commitment to service and quality. Please allow at least 2+ weeks for your clock. Email Photo information for the clock.